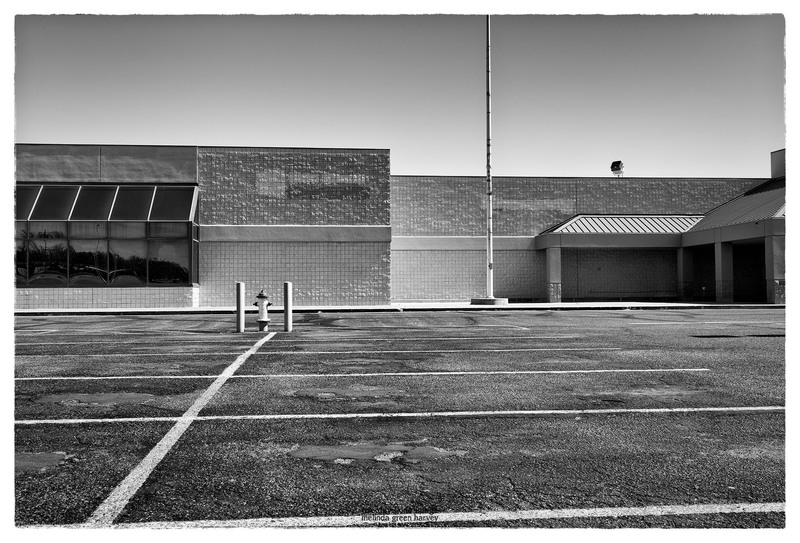 Here’s the last of the dead K Mart photos, with the floodlight pointed toward nothing. Posted on March 24, 2017, in Photography and tagged 365 photo project, abandoned buildings, black and white photography, dead K Mart, future of retail, K Mart, learning to see, Leica, lubbock, lubbock texas, melinda green harvey, monochrome, one day one image, photo a day, photography, postaday, texas, thoughtful seeing. Bookmark the permalink. 4 Comments. KMart is having financial difficulties here, too. I don’t think whole stores have closed as yet. At the moment I think they are trying new marketing ploys. It seems strange that a space this large could be left abandoned in a thriving community. It’s a HUGE place, and it’s hard to even imagine what might be big enough to fill it up again. Unfortunately, Lubbock’s flat, with nothing to constrain growth, so there’s no big incentive to reuse this place, in an older part of town, when there’s tons and tons of land out on the edge of town, where all the cool new stuff is. Things change so quickly in retail but what a waste of resources!